I decided the monthly(ish) updates worked for me … maybe I’ll get a little more frequent as we hit the last 4-6 weeks! How far along? Today is Monday, May 18, and I’m actually 34 weeks and a few days. It is crazy how time is flying. Total weight gain/loss: BabyCenter tells me this is when the baby gains about half a pound a week, and I can certainly feel it! I’ve gained about 23 pounds total since the beginning of the pregnancy now. Yes, that is about 10 pounds since my last update! I’ve still been watching what I eat but the baby growth has been insane. The fluid retention too … ugh. Welcome to the third trimester, the start of summer, and Houston. Yay. Maternity clothes? I did pull off the wedding outfit I had planned at my sister’s wedding at the end of April … with help from maternity Spanx and a Stitch Fix maternity camisole that essentially was a body stocking. It was so long that it covered me to mid-thigh, and it was much appreciated! Otherwise, I’m starting to move up to the fantastic third trimester sizes … one size bigger than I’ve been wearing all along. My pajamas don’t fit, my clothes are too tight, I’m hot, and I hate getting dressed in general. Yep, right on schedule. 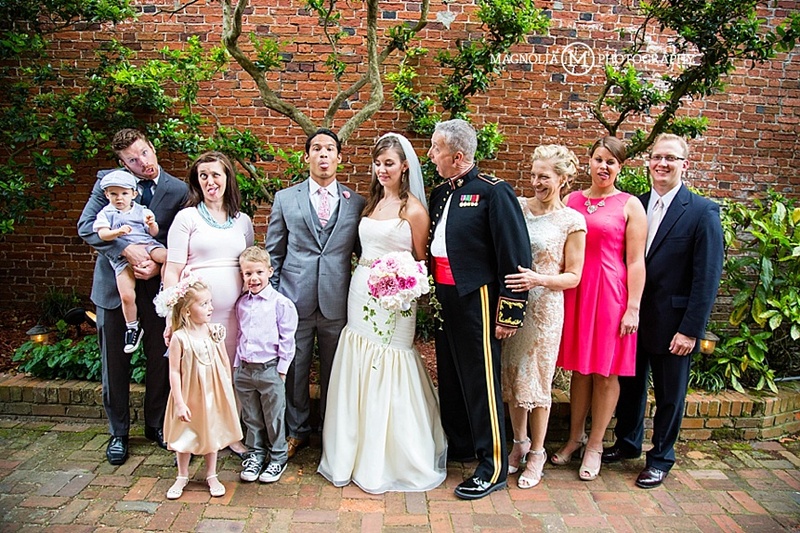 Family photo from the wedding, beautifully captured by Magnolia Photography. Were special. Stretch marks? My legs will never be the same. Let’s just leave it at that. Sleep: Has become a horribly uncomfortable experience. Even with the pillows propping me up, I get breathless on my right side, sore on my left side, and all-around cranky. I also now have a regularly timed (it seems) pee break in the middle of the night. C’est la vie, ce sont les dures semaines. Best moment this week(s): We went for an elective 3D/4D ultrasound at the end of April so the kids could see the baby. I’d never had one before, and I’d heard they can either be great or a little spooky. We lucked out and got a GREAT view of our Baby Mouse! Movement: ALL THE TIME. Mouse still has occasional quiet days, but is definitely at the size where I can feel most movement. S/he really likes to plant feet into my right ribs, and also likes to roll from side to side. Not quite the gymnast that Nora was, but definitely a mover! Food cravings: Warm cookies. The lack of warm cookies almost had me in tears one night, and I knew was being totally irrational and still couldn’t help it. I just don’t understand why people can’t drop everything and find warm, fresh-baked cookies. Oh, and a Coke! Ice-cold Coke sounds WONDERFUL. Anything making you queasy or sick: Lots of smells, including cigarette smoke in any form or fashion. I’m grateful for a current allergy attack because I can’t smell things. Gender prediction: Still thinking it’s a girl, but a little less sure after that ultrasound! There are some distinctly Seth characteristics in that sweet face … but also Nora, and also Jude! We’re having a hard time coming up with boy names, but now I feel more urgency to get one lined up! Belly Button in or out? Half in, half out! This may be my first pregnancy with an outie. Wedding rings on or off? It depends on how hot it is and whether I’ve been traveling. After my trips to DC and North Carolina I definitely had to take the rings off. They’re back on now, but not as loose as they were. Feeling all the Feels or Just Some of the Feels? More and more emotional. I’m over it, but I know it’ll just get “enhanced” as the fatigue sets in from not sleeping well and carting around the extra weight! Weekly Wisdom: It’s really hitting me that this is my last pregnancy. The constant baby gymnastics can be exhausting, but I know for sure this is the last time I’ll experience them. With Jude we were on the fence about whether we’d have another, so I tried to enjoy as much as possible. Now I know this is our last baby, so I am trying to savor the special things about pregnancy that I won’t experience again. Milestones: 40 days until my due date. WOW. Pregnancy Fitness: I’d love to say that I’m still keeping with the yoga, but honestly … walking in general is a fitness exercise for me right now. The last month has been crazy with travel and family commitments, so I’m hoping to get at least some pieces of yoga practice in again before baby arrives. If nothing else, I’m at least doing my Hypnobabies tracks for MENTAL fitness! « Pregnancy Update: Weeks 21 – 25 … Oops.